At work yesterday, we decked the halls until they could no longer be decked. Giant bows, shiny snowflakes, and twinkling lights were everywhere. Sitting on a top of a bookshelf, customers will find my big, white Christmas tree. It's quite lovely but we didn't have room on the floor so on top of the bookshelf it went. There's just something about a white Christmas tree that I love. It's the perfect tree to display your colorful ornaments on. It's the color of freshly fallen snow. Also, it feels less like you're trying imitate nature when you decorate with an artificial white tree. I mean, the green, artificial tree just knows he can never look like the real thing so why not try a new color, right? 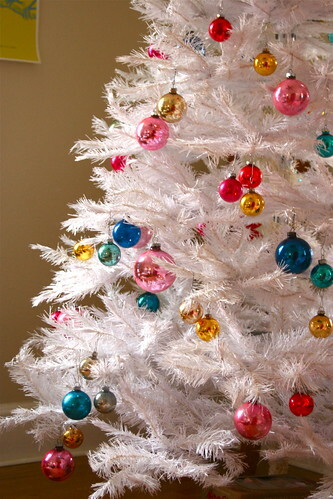 I fell in love with white Christmas trees once I saw this tree from Rachel Denbow. It makes me want to put up the rest of my Christmas decorations. Have you started putting up your holiday decorations yet?